Jasdev Singh, commentator gets Rajasthan Ratna Awards 2013. 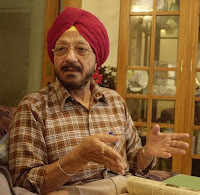 Jasdev Singh is an Indian sports commentator. He was awarded Padma Shri in 1985 and Padma Bhushan in 2008. He has also been official commentator on Independence Day, and Republic Day parade broadcasts since 1963 for state run media, Doordarshan and also All India Radio. He joined All Indian Radio Jaipur in 1955, and moved to Delhi eight years, thereafter he was joined Doordarshan, where he has been working for over 35 years.